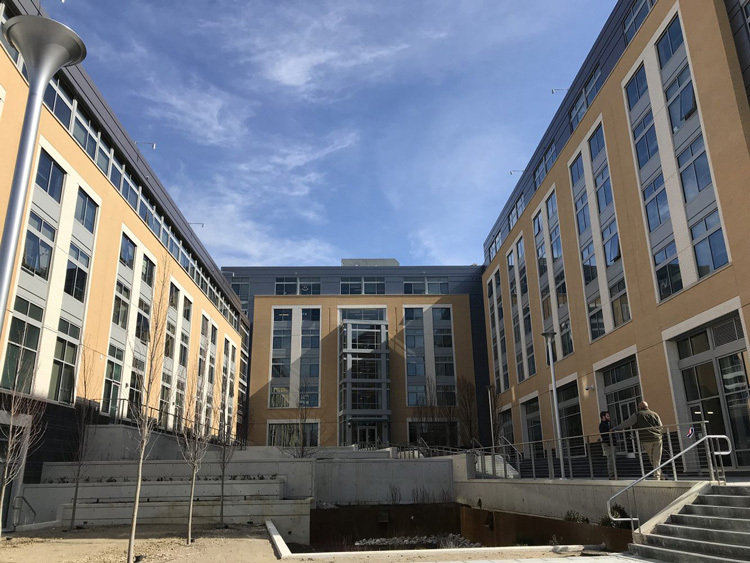 Philadelphia — The Harman Group (THG), a firm specializing in structural engineering and parking planning and design, announced the grand opening of Living & Learning Commons, a new dormitory at University of the Sciences (USciences). The 126,000 square foot, 426-bed mixed-use student housing complex will offer students on campus a place to sleep, study, and shop. The Harman Group provided structural engineering services for the project, working with developer, Campus Apartments and Baltimore-based architecture firm, Design Collective. Built on the site of the shuttered Alexander Wilson School, The Harman Group also provided an analysis of the existing Wilson School structure, with the goal of preserving as much of the existing foundation as possible. The south end of the site and parts of the southeast foundation were retained in the final structure. The structural system has a transfer slab above ground-floor classrooms with load bearing cold formed studs walls and precast plank for the student housing above. Hand laid brick at the perimeter required a hybrid of steel and cold formed steel. The building is designed to achieve two Green Globes, the approximate equivalent of USGBC LEED Silver certification. A large public courtyard acts as the project centerpiece, which is surrounded by ground floor retail, classrooms, residence life offices, staff apartments and resident amenity spaces. Five stories of student units sit above these public uses.